Flossing is one of those utterly essential practices--an anchor in a well-rounded and comprehensive oral-care routine--which, nonetheless, many people choose to neglect. Why? Well, probably because it seems that much more difficult than swashing the mouth with a toothbrush or mouthwash: Something about the acuity involved in rubbing between every tooth seems to turn people off. 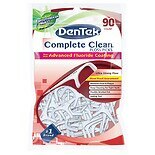 For those who find a spool of floss challenging or uncomfortable to handle--and you're not alone if that describes you--Walgreens stocks a wide assortment of alternatives, including many varieties of dental picks under the venerable Dentek brand. 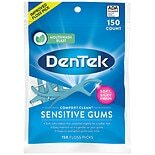 These designs make it easy and comfortable to navigate around your teeth without unduly straining your wrists and hands, rendering it that much easier to lessen the likelihood of periodontal disease. 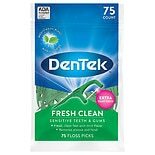 A few minutes of flossing with Dentek floss picks each day--in tandem with thorough brushing--can translate to immense rewards when it comes to oral health. In other words, you've run out of excuses for avoiding daily flossing: Here are tools so easy to use that they become second nature. 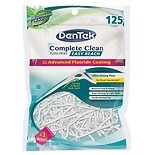 It's impossible to overstate the importance of regular flossing. A toothbrush is, of course, the reliable anchor of your dental-health regimen, but its bristles only reach so far in the complicated terrain of molars, incisors, and all the rest. 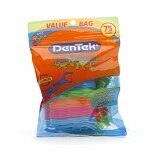 Food particles regularly lodge in the gaps between your teeth and in the crooks between teeth and gums. 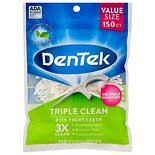 Left to fester, these promote proliferations of bacteria that lead to the filmy buildup of plaque and, ultimately, tartar. These accumulations result in the onset of periodontal disease: first gingivitis, in which the gums become tender, swollen, and--exposed to the bristles of a toothbrush--downright bloody; and then periodontitis, which at its worse sees major recession of the gums and the enervation of bone to the extent that teeth may fully dislodge. 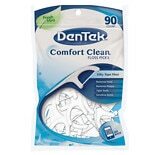 Dentek floss picks give you a tool to diligently clear nooks and crannies of food debris and bacterial accumulations. In addition to preventing periodontal complications, flossing can also promote fresher-smelling breath--a secondary bonus. 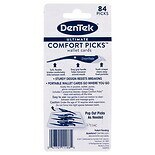 Check out the selection of Dentek floss picks at Walgreens, and ensure your oral-care routine is as robust as it can be.